Cromwell, CT — “Disasters Happen. Prepare Now. Learn How.” That is this year’s theme for National Preparedness Month. 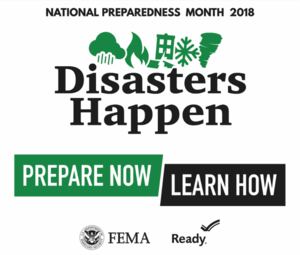 Held annually every September since 2004, National Preparedness Month provides an opportunity to remind everyone to prepare themselves and their families in case of an emergency or natural disaster. Disasters can be anything from having a fire in your kitchen to a flash flood sweeping away your belongings. In both of these situations your family needs a plan of action to prevent anyone from being hurt and from being caught off guard financially. Better Business Bureau is proud to partner with FEMA and the Department of Homeland Security (Ready.gov) to offer tips on how to fully prepare for a disaster. Make and Practice Your Plan: Disasters don’t plan ahead, but you can. Start by making an emergency plan with everyone in the home. Discuss how you will receive emergency alerts and warnings, what your shelter plan is, your evacuation route, and the household communication plan. It’s best to practice your escape plan with your family, including animals, at least twice a year. Watch Out for "Storm chasers": No matter how much you prepare, you might have some damage to deal with after a natural disaster. “Storm chasers” are contractors who seek to take advantage of disasters and get consumers to make quick and potentially uninformed decisions. Although not all storm chasers are scammers, they may lack the proper licensing for your area, offer quick fixes, or make big promises they can’t deliver. Click here for BBB’s tips on how to protect yourself from storm chasers. Remember you can always visit bbb.org to review a company's marketplace report before you hire them. You can also call Better Business Bureau Serving Connecticut from 9 a.m.–2 p.m. Monday through Friday at 860-740-4500.